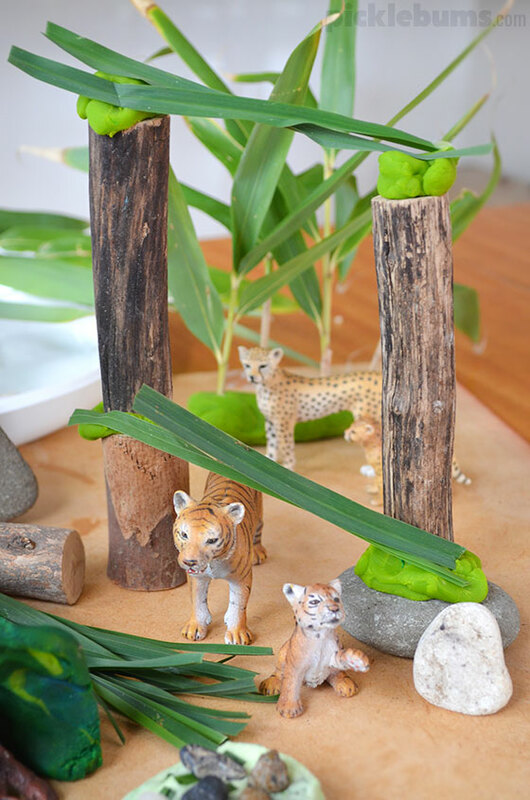 The first time we put together a jungle play dough kit it was for my big boy’s fourth birthday. It was the beginning of my kids absolute passion for play dough, and his sisters collected all kinds of green items (green was/is his favourite colour) and helped to make play dough and wrapped it all up as their birthday present to Morgan. He LOVED it. 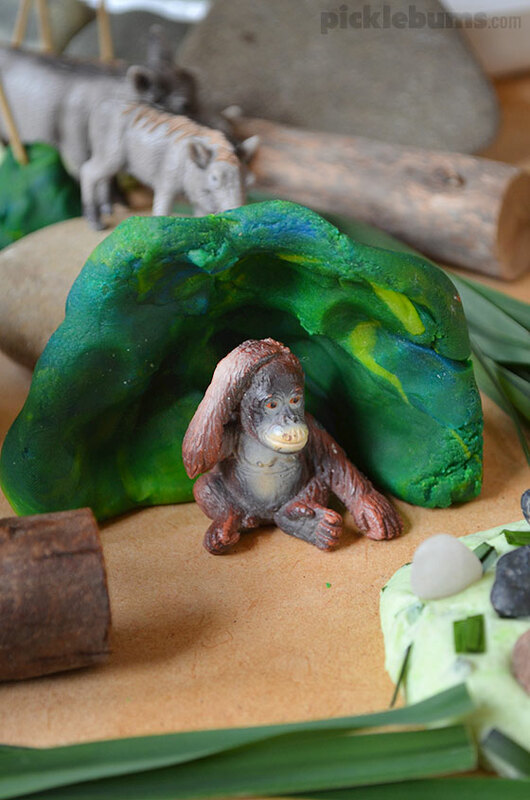 Since then we’ve made a couple of jungle play dough kits, as birthday presents, and just for fun. Putting together a play dough kit is easy. You can get super fancy and buy all kinds of fabulous accessories, but I bet you can find a whole heap of great little items to add from around the house. 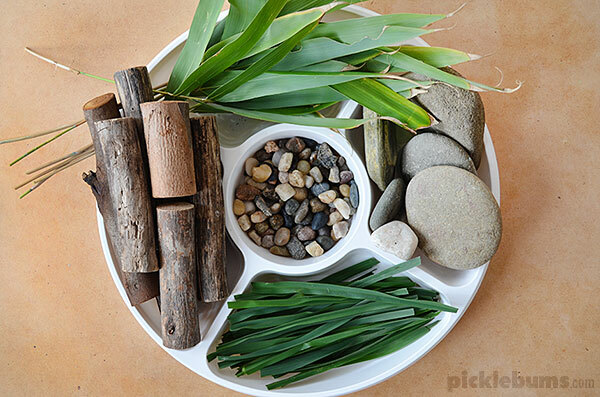 All of the items we used for our jungle play dough kit were things we already had, or that we collected from the garden. 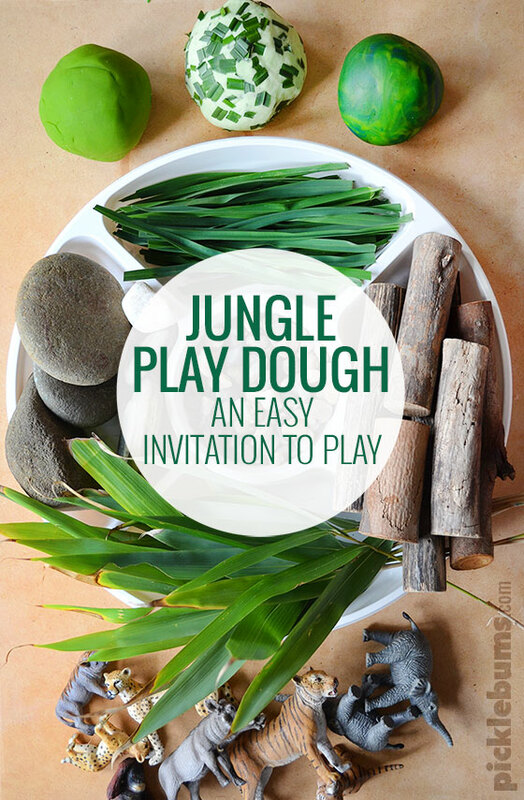 Use your imagination or ask the kids what they think would be good for a jungle play dough. Now that you have the accessories you need some dough! We used our easy microwave play dough recipe to make one batch of plain dough. We coloured 3/4 of the dough green and 1/4 a dark greeny blue. Then we swirled some of the green play dough into the blue to make a cool swirly, greeny, bluey, jungley colour. We also made some grassy dough. 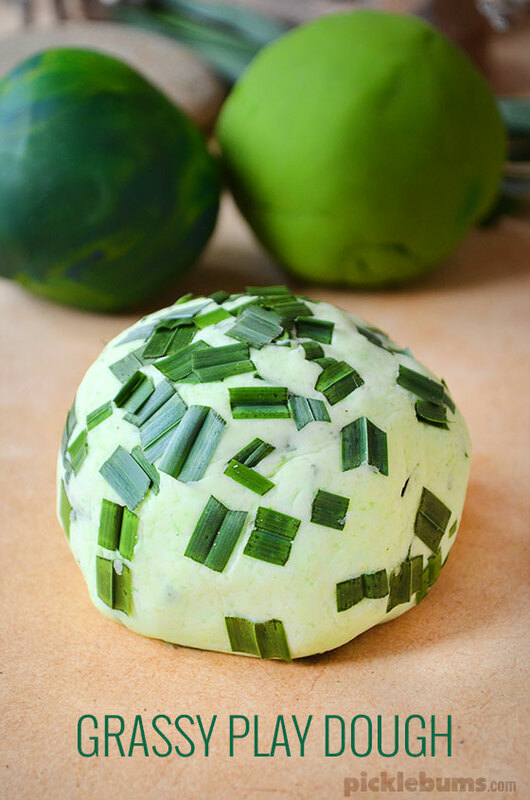 To make the grass dough use the easy microwave play dough recipe (or your favourite play dough recipe), and add a tiny amount of green colouring to make a light green dough. Once the dough has finished cooking cut up some grass into tiny pieces using some scissors. You’ll need about a cup of cut up grass to make the dough. When the dough has cooled a little, sprinkle the grass onto your work surface and roll the dough in the grass, kneading and squishing until all the grass is mixed in. 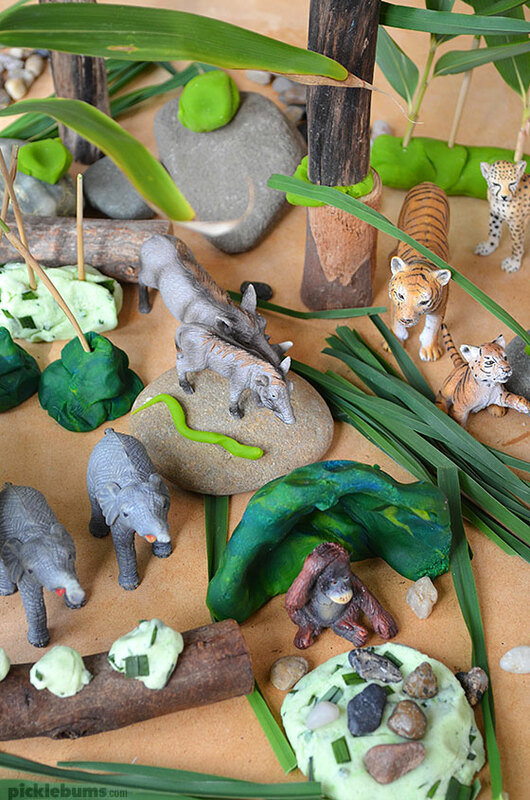 Once we had some fun accessories and some play dough, all we needed to do was to collect some jungle animals. We had a quick google to find out which of our animals might actually live in the jungle and we were ready to play. Morgan is much older now, and while he hasn’t gotten any play dough kits for his recent birthdays, he still had loads of fun playing with this new jungle play dough invitation to play that his little brother and I put together. It seems the play dough love never truly dies, no matter how old you get! We first shared this idea back in 2011. We have edited and updated the content and images, but the basic ideas are the same and you may will see comments from the original post. Honestly, play dough gives me the absolute shits! But the reality is the kids love it and can play with it for hours on end. When they have it out the tub sits on the table and they get it in and out each day for a good week, before I’m completely over it. I just hate that no matter how hard I try I can’t contain it, for some crazy reason my son always seems to drop some on the chair and then put his knee in it. What is with that! I so hear you Mandy. For ages I detested the stuff but I’ve done a lot of personal work on letting go of my issues with mess… probably helps that we have all floor boards so no play dough smooshed into the carpet. Mind you we are building a HUGE covered veranda and when the renos are finished play dough will be an outside thing! What a lovely present- so thoughtful (as it is green!) and a nice gift from big sisters without needing mama to shell out for the present. Much. 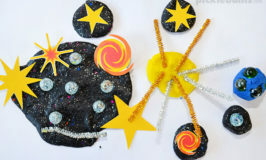 Thanks for sharing microwave playdough recipe. Will have to try it! This is a lovely idea. I love that your girls thought of it and helped put it all together. Sometimes the best presents are ones we can make ourselves and playdough sure fits the bill. What a wonderful idea… Going to get creative and see what I can do! We only have a bucket of 100 plastic cookie cutters that were $10 at Aldi when my toddler was 6 weeks old… He loves them but I think he needs a bit more! Oh we have that bucket of Aldi cutters, they were good value! We bundled up some cutters and made play dough and gave them as Christmas gifts that year! 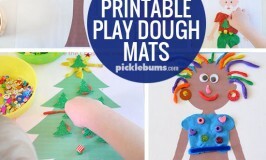 So many cheap, or free things you can add to play dough. I’ll get my kids working on a few more sets and blog some other ideas soon! Dear Izzy and Zoe. You are awesome sisters. Your playdough-present idea for Muski was totally cool. From SquiggleMum. How sweet! My daughter would love this. Great idea..I’ll try it! Thanks for sharing! When do you add the food coloring? Before cooking it in the microwave or after it? Either is fine. I find it easier to add it mixed into the water before you cook it, you get a nice consistent colour that way. But it is also fun to knead the colour into the dough after it is made, though that can get a bit messy!